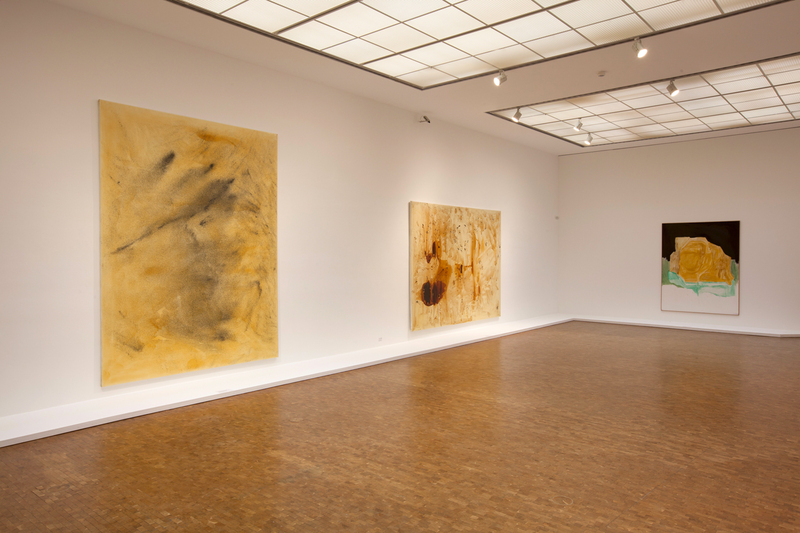 COLOGNE, Germany — Sigmar Polke was based in Cologne for over 30 years before he died there in 2010 at age 69, and his Alibis: Retrospective brings his body of work home to rest at the Museum Ludwig. The show cleanly displays roughly 250 items he left behind, generally segregating them by medium. Taken together, the works divulge, veil, dissemble, and entangle late-20th century overcooked Pop imagery and beautifully illustrate Polke’s commitment to meaningless charade. An inescapable reference for me behind his work is the painter/poet Francis Picabia, as both shared an open-minded, post-conceptual practice that was Dada in its playful, Duchampian sensibility. From 1961 to 1967 Polke studied at the Arts Academy in Düsseldorf under K.O. Götz and Gerhard Hoehme, and where Joseph Beuys was quite influential. There, he attended the 1963 Fluxus festival and developed his Neo-Dada, Fluxus interest for the instability of process. Polke integrated the photomechanical into his paintings as early as 1963 — work that paved the way for his penchant for image manipulation. In addition to these titanic paintings, there are wonderful, dainty watercolor drawings from his youthful notebooks. Ghostly, washy photographs, taken on the suffering, old Bowery, span an entire wall. Astonishing are the bizarre appropriations of found images in photo-based prints like “Untitled” (1975) and “Untitled (Quetta, Pakistant)” (1974–78) and the intensely complex stencil paintings, like “Pill” (1976) and “Alice in Wonderland” (1972). The show stresses his paintings, but the films are the buried truffles. 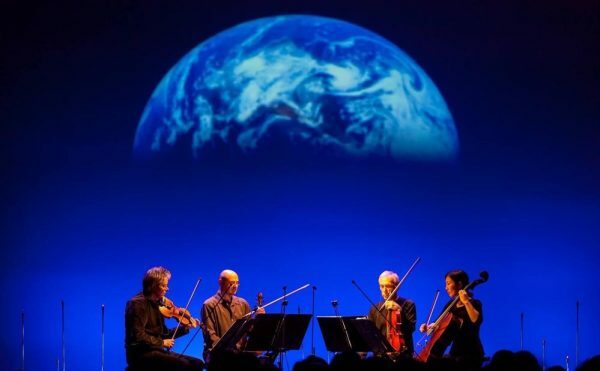 They are the key to the oeuvre, as film permeates all his ethereal creations. The semi-translucent qualities of film — its chemical make-up and its casting of a wide but immaterial projection — pervade his work. It’s also worth noting that Polke as a teenager apprenticed in a stained-glass studio: the art of translucency par excellence. In works like “Pill” (1976), Polke raises awareness of a key contemporary dilemma: the interface between our physical reality and cyberspace, where form is set adrift and caught between two spaces. The work’s translucent and virtual quality, stemming from Polke’s central idea of art as a slippery process, gives “Pill” (and most of his work) an immaterial reality that is shared with media distribution on the net. 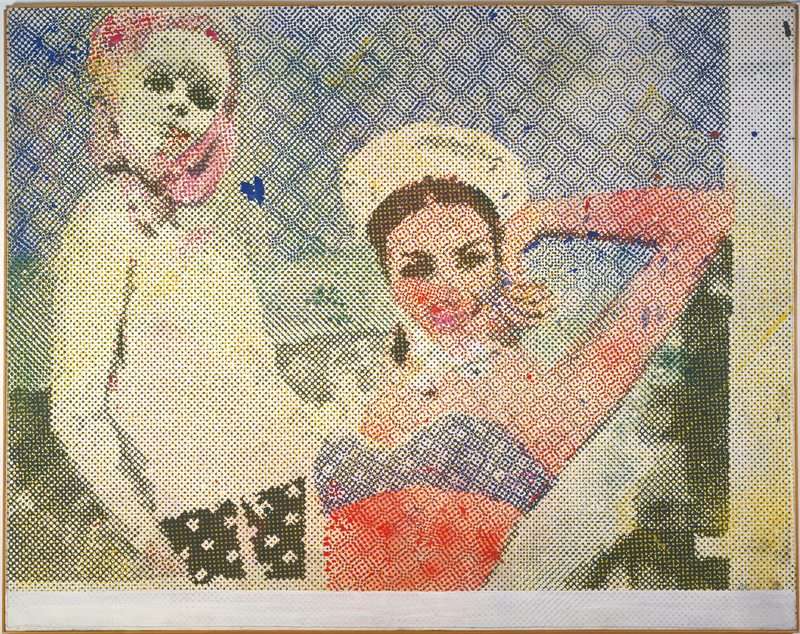 We also see this in his early media-based paintings such as “Girlfriends” (1965/1966) where Polke incorporated the photographic reproductions of raster dots that were used in prints. 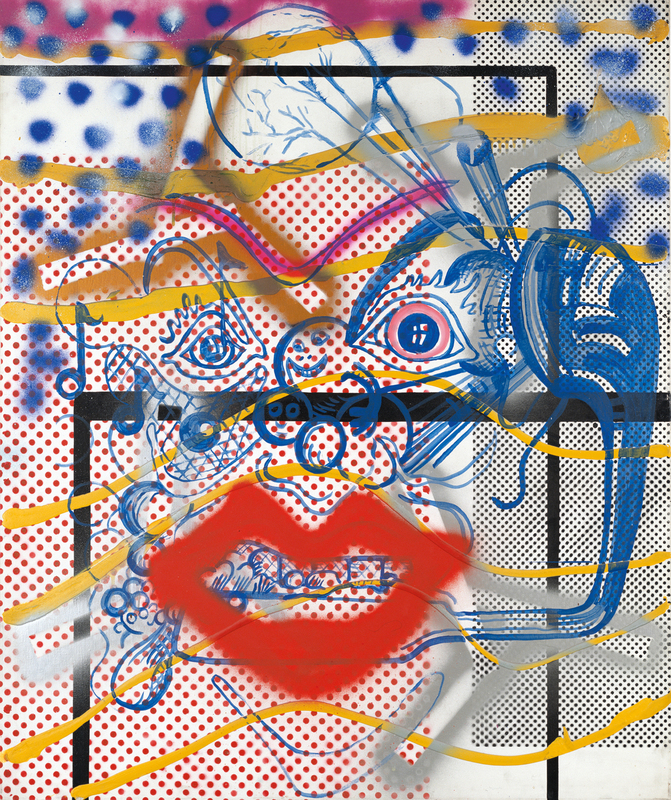 It is a work that also calls to mind Roy Lichtenstein’s “Look Mickey” (1961) where he first employed the Ben-Day dots printing process. At the entrance of Alibis is a photograph of Polke, along with his bio, holding up the Mothers of Invention’s 1970 album cover Weasels Ripped My Flesh. This record’s outstanding use of free jazz, sonic experimentation, lyrical nonsense, and noise music turns out to be another source of inspiration for Polke. The reference offers another context for his anti-authoritarian images. 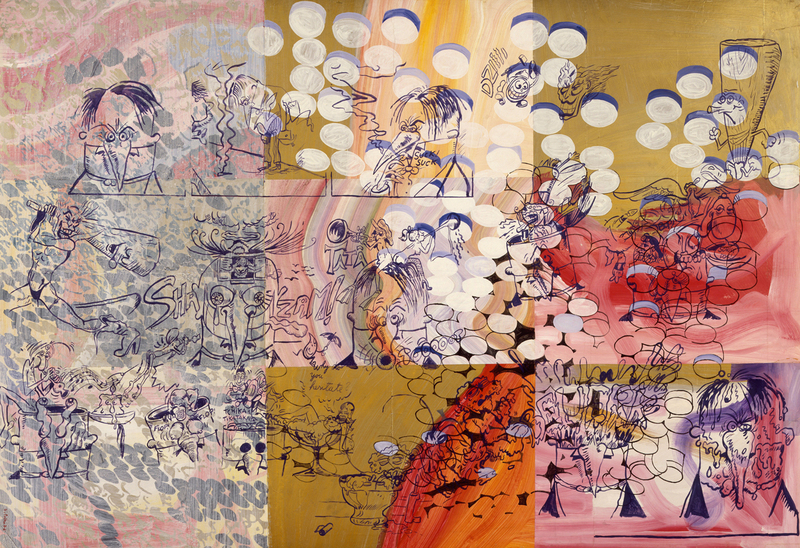 Although pop-oriented, like Zappa, Polke’s trippy work is charged with the mystery and chance of everyday life. Wild image clusters, like in “Dr. Berlin” (1969–74), mash up hallucinatory Henri Michaux-like, mind-bending art with Thomas Bayrle’s tech art. Indeed, there is something of the sensual enjoyment of getting high throughout this show that so pervaded the ‘70s and ‘80s cultural scene — even though it was installed far too high up on the wall, the wobbly “Dr. 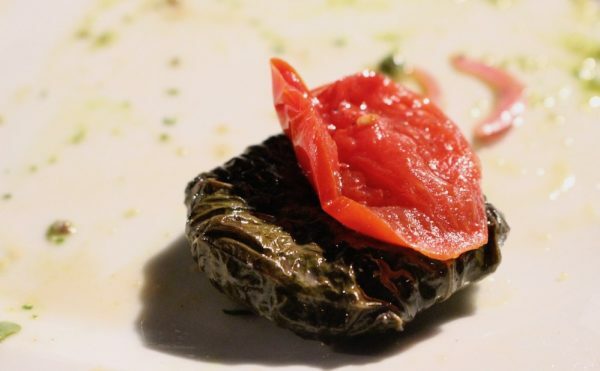 Berlin” amusingly decomposed and melted the more time I spent with it. But there is also something tongue-in-cheek about its caustic punk humor and the way the pop imagery falls apart. Polke’s brilliant instinct for the deteriorating figurative image — such as when he barely paints “Why Can’t I Stop Smoking?” (1964) or loosely paints over tawdry pattern fabrics, as with “Heron Painting I” (1968) — indicates something deeper than pop. He shows himself to be somewhat of a symbolist painter, one alert to the stylistics of both pop (a badly formulated misunderstanding of the deeper stakes in life) and lyrical abstraction. In that respect his work is indeed a form of anti-pop (or post-pop) art, and is somewhat inspiring in our tedious times of celebrity culture. There is also a cosmic side to Polke as seen in the early, altogether deviant, film “The Whole Body Feels Light and Wants to Fly…” The 16mm film (transferred to digital video) with sound overlay is an audacious 1969 collaboration between the artist Christof Kohlhöfer and Polke depicting something of an eccentric séance. 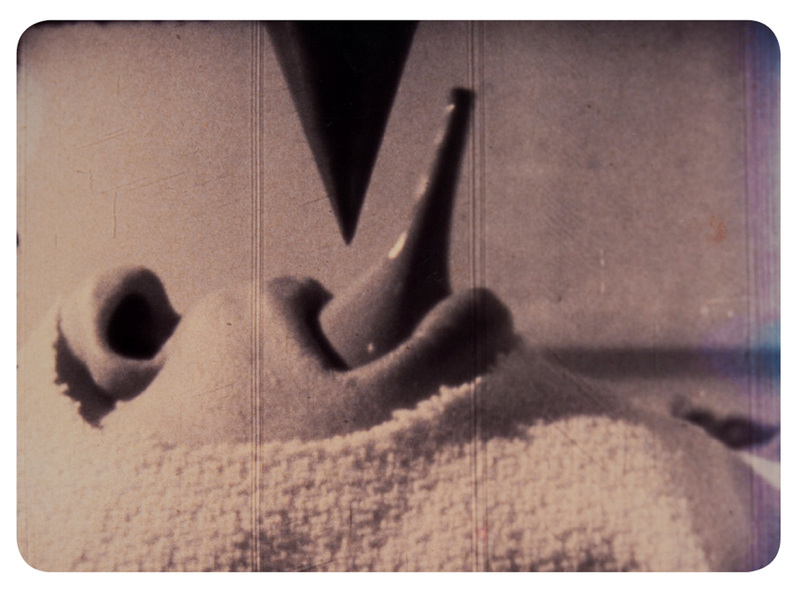 One scene, that recalled Bruce Nauman’s body-based video work “In Stamping in the Studio” (1968) where he filmed himself repeatedly stamping back and forth across his studio floor, shows Polke furiously and repeatedly scratching himself over his clothes as two Brenda Lee songs play over each other. There is no Debordian spectacular society portrayed. Rather, Kohlhöfer traces the tension between a dreamy Polke and emotionless trance. The camera takes very unusual perspectives. For example, we see Polke undergo something of a tortuous encounter with the magic of a pendulum. Reclining, his face is covered by a white hood, showing only his nose and mouth through a roughly cut hole. In his mouth he is holding and moving up and down a rubber turkey baster. Amusingly, he jousts with the metal tip of the swinging pendulum. In a voice-over we hear a cackling Polke read a weird but poetic text that includes bits from The Secret of the Golden Flower: A Chinese Book of Life and The Seventh Book of Mosis. But the best bit of the film does not feature Polke: a lengthy overhead shot of an overstuffed lackluster chair that, after being drenched in water, takes on an almost fairylike quality under the rhythm of a swaying ceiling lamp, while a homemade noise soundtrack plays. Kohlhöfer achieves this machine-like sound by plunking a metal knife on a tabletop and processing the resulting tinny vibrating sound through six cassette tape players. The soundtrack is brilliant — a first-rate example of beautiful and agitated noise art, typical of a post-minimalist/post-conceptualist spirit that turned toward the absurd so as to transcend the banal world. I found it very astute. With Polke, art can now be part of our tech culture and behave like a dream, free from some of the classical strictures of time and space, and free from some of art’s traditional earthly limits. 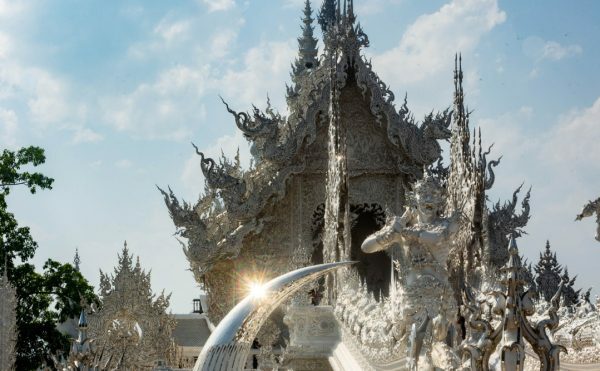 For some, this merging of art and technology has demanded a new need for the “real” of the tactile. But for Polke, art existed as “real” when he could create it through process-based technological apparatuses. 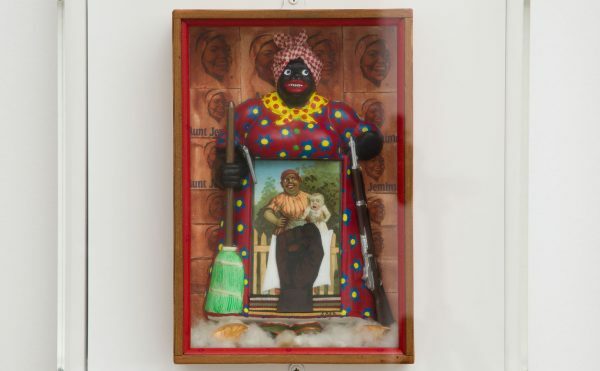 In his work, he dreamed up of new realities that transcended country, race, and gender. I understand this aspect of Polke as the anti-materialist in him. More than anything, his art displays and embodies the German aphorism that best sums up the work of Sigmar Polke: Wir sind high und frei (We are high and free). Alibis: Sigmar Polke Retrospective continues at the Museum Ludwig (Heinrich-Böll-Platz, Cologne, Germany) through July 5.